A little more than five months ago, Sam Balducci, the owner of Giant Fitness, was approached by his cousin’s husband with a request. Bil l Ewald, a retired corrections of- ficer, was tipping the scales at 340 pounds and desperately wanted to get in better shape. He asked Ba lducci to help him reach his goals. When Giant’s newest location in Voorhees opened on May 1, Ewald was there to begin a plan that Balducc i designed for him. It included a focus on strength training, cardio, controlling his heart rate and eating a low-sugar, low-salt diet. Ewald embraced the new lifestyle and today, the results speak for t hemselves. He has lost more than 90 pounds—getting down below 250—and ca n be found every day of the week at Giant Fitness in Voorhees , getting in his workout. Balducci has been in the fitness industry for 30 years, since he opened his first gym at the age of 27. 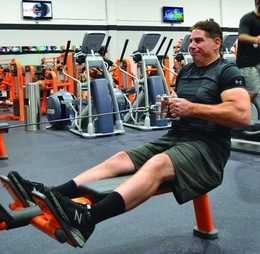 H e went on to create Giant Fitness, which is thriving in South Jersey with seven locations. The Voo rhe es location has taken the company’s commitment to providing an abundance of top-of-the-line equipment to a whole other level. The fre e weight room alone is 6,500 square feet—double or even triple the size of most gyms in the area. The cardio room is more than 7,000 sq uare feet and the facility has machines from the biggest names in the industry, including Cybex, Precor, Life Fitness and Hammer Strengt h. At most gyms there is plenty of waiting around for weights or machines, making it difficult to focus on your workout. That is never a n issue at Giant, which takes the stress out of the experience. That selection is crucial because Balducci’s philosoph y on fitness is centered on strength training and controlled cardio workouts, rather than aerobics, spin classes or the latest exerc ise craze. He believes those ac- tivities raise the heart rate too high, leading to inefficient training and poor results. “When your hear t rate goes too high, your body goes into a defensive posture and shuts down,” he say s. “It stores all the fat and burns up all of your mu scle. Most people don’t realize this. Giant’s Voorhees location has partnerships with the r enowned Jersey Wahoos swim program, Rhino Wrestling Club and FitLife Training. Basic memberships can be obtained for just a $59 down p ayment and $10 monthly fee, with no long-term contract—they can be canceled at any time with 60 days notice. Every member also receives a free fitness consultation with a personal trainer. “If somebody signs up and they know what they’re doing, they can decline the free tra ining session,” Balducci says. “But if they want help, we’re happy to give it to them.” Balducci continues to feel fulfilled after thr ee decades in the business. When he sees someone like Ewald training the right way and getting rewarded for his efforts, there’s no better feeling.